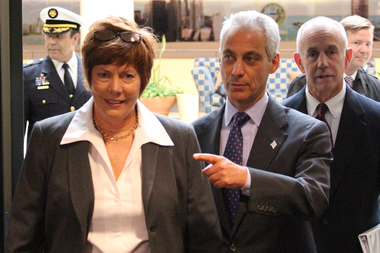 Alicia Tate-Nadeau is guided into the city's 911 call center by Mayor Rahm Emanuel and Gary Schenkel, with Fire Supt. Jose Santiago (l.) in the background. WEST LOOP — Mayor Rahm Emanuel named a new head of the city's emergency-response office Wednesday: Alicia Tate-Nadeau, a South Loop resident who is the first woman to earn the rank of brigadier general in the Illinois National Guard. "There's no greater responsibility as mayor than keeping our residents safe and secure," Emanuel said in introducing Tate-Nadeau on Wednesday as the new executive director of the Office of Emergency Management and Communications. He cited man-made and natural disasters from the recent terror attacks in Brussels, Paris and San Bernardino, Calif., to the two "storms of the century" the city has been hit with the last two winters, as the scope of the office, as well as handling 911 calls for the Police and Fire departments. Brig. Gen. Alicia Tate-Nadeau has her new rank pinned on her uniform by her children at the promotion ceremony last year. Emanuel pointed to Tate-Nadeau's 30 years in the Illinois National Guard, including earning a Bronze Star in Iraq, and her recent work with the Federal Emergency Management Agency, and said, "She has the experience and the expertise to respond to the threats we face today," both man-made and natural. Both Emanuel and Tate-Nadeau lauded the five years in the post by outgoing Gary Schenkel. "I'm very fortunate to be walking into a job where there's been outstanding leadership and it's just being handed to me," Tate-Nadeau said. She praised Schenkel's work coordinating various city departments in responding to emergencies, and said she intended to maintain that approach. "This is a team. It is not by chance, but by design," Tate-Nadeau said. "Whenever we talk about emergency management, this is a team sport." She added that she advocated a "whole community philosophy," bridging federal, state and local agencies, both public and private. In an extensive interview with DNAinfo Chicago just a year ago, Tate-Nadeau said she is "a pretty strong believer in giving back to society," and in a statement released late Tuesday night the Mayor's Office cited her "three decades of experience in national security, emergency management and public-safety issues." Tate-Nadeau is the assistant adjutant general of the Illinois National Guard, and has taken on a major federal role in handling emergencies in the Great Lakes region. 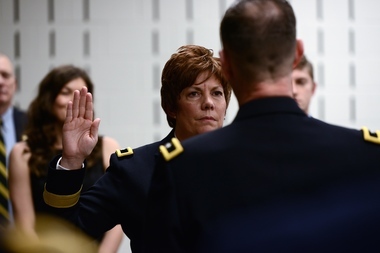 Last year, she made history as the first woman promoted to the position of brigadier general in the state National Guard. Tate-Nadeau, however, has in some ways dismissed that groundbreaking honor, saying: "Being a leader transcends gender and everything else. I never wanted to be the first female officer. I wanted to be the best officer." She has served overseas in Iraq and Israel, where she worked with international U.S. partners on public-safety issues. Currently, Tate-Nadeau serves as the lead on the federal response to the water crisis in Flint, Mich. According to the Mayor's Office, Schenkel recently informed Emanuel he wanted to leave the post he's held throughout his administration. Earlier reports on WMAQ-TV Channel 5 had former interim Police Supt. John Escalante moving over to head OEMC if the mayor had selected Georgia law-enforcement officer Cedric Alexander as police chief. Emanuel instead chose Eddie Johnson to serve as new interim police superintendent on Monday, with Escalante remaining in the Department as Johnson's top deputy. Tate-Nadeau heads a 12-person rapid-response team assigned to cover the Federal Emergency Management Agency's Region V, comprising the Great Lakes states of Illinois, Indiana, Ohio, Michigan, Wisconsin and Minnesota, which is how she drew the assignment of taking on the Flint, Mich., water crisis. She moved to the South Loop last year to put herself at the center of the Great Lakes region and immediately embraced the neighborhood, saying, "I just like the feel and the vibe of the area. "I love being able to walk to everything and walk to the lake," she added. "I can ride my bike, I can run, there are dog parks, green space, local restaurants. ... Those things are what really attracted me to it."